There are many GIS software packages available, but by far the most widely used is a set of tools known collectively as ArcGIS Desktop by Environmental Systems Research Institute (ESRI). We will be using version 10.2.2 in our lab, but you should be able to use 10.0, 10.1 or 10.2. ArcGIS 10.3 is in the process of being released and we will not use it this semester as new releases are sometimes unstable with ESRI. Since the work of GIS can be quite complex, the suite of software tools are quite complex also, and require some explanation. ESRI uses all sorts of similar names to describe pretty distinctive things so the nomenclature can be really confusing. ArcGIS Desktop is now comprised of five core modules: ArcCatalog, ArcMap, and ArcToolbox, ArcScene and ArcGlobe. These three programs form the basis of all GIS work we will do. To further confuse you, ArcGIS Desktop comes in four flavors (ArcReaderr, ArcView, ArcEditor, ArcInfo), that range from free (ArcReader) to quite expensive (ArcInfo). To complicate matters more, there are a number of optional extensions you can purchase. We will use ArcInfo in labs with all the extensions loaded and the free one-year student version we will provide you, features a fully functional version of ArcInfo with all the extensions. 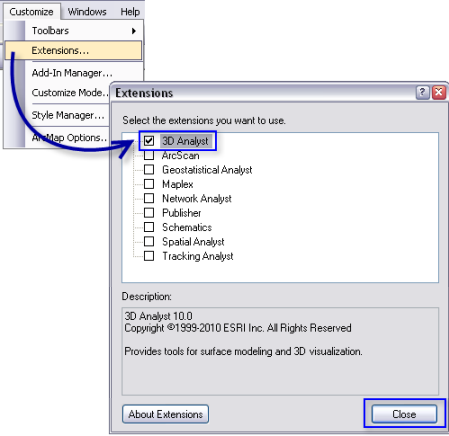 The extensions we will primarily use include ArcGIS 3D Analyst and ArcGIS Spatial Analyst. ArcCatalog can be thought of as being similar to "Windows Explorer", but for GIS data. As the name implies, it acts as a catalog of data files, allowing you to browse through your data, organize and preview it, import and export data to different formats, connect to external data sources, plus a few other tasks that will be covered later. New in ArcGIS 10, ArcCatalog can also be used as a dockable window within ArcGIS. See our Working With ArcCatalog Introduction. ArcMap is where most of the work takes place. In ArcMap, you can create and edit GIS data, make and publish maps, and perform various types of GIS analysis. This is where you will spend most of your time. See our Working With ArcMap Introduction. ArcToolbox is indeed like a toolbox for performing tasks beyond what you can in ArcMap. It can be used standalone or it will also "dock" into both ArcCatalog and ArcMap to give you convenient access to the tools. There are a great many things ArcToolbox will do, and we will cover these in future labs. For reasons that defy common sense, ESRI consistently makes it hard for you to install and use the extensions you spend so much extra money on. Instead of making these available by default, you have to deliberately turn them on. Be careful when you install ArcGIS that you do a custom installation that includes the extensions! When using ArcGIS, for the first time in a Windows user profile, all extensions need to be enabled and you have do this separately in ArcMap and ArcCatalog. You may find that you need to do this just about everytime you use a different computer in lab! We have also noticed that even on a machine and user profile where you have previously turned these on, some Windows Updates can reset this setting. Aghh!!! So if ever you have a problem with an extension toolbox command not working, double check these settings.